Looking at the set itself and (for the time being) ignoring the figures the Hydra "tank" (though it looks more closely resembles an APC) and motorcycle included in 76017 aren't all that impressive but they're not dissappointing either. The Hydra "tank" is a well constructed, mid-sized vehicle (a staple in Super Heroes sets of this price point) that has an impractical turret along with some nice olive green sloped pieces and large-ish black wheels/tires making for a decent final product that goes along well with the respective figures. The dark red classic-style bike though not too notable is a nice additon and is a fitting vechile for Captain America. As is standard for a Super Heroes set of this price point super heroes set we get a trio of figures a rule which has apparently been set in stone since the start of the theme, (seriously every set of that price has had exactly 3 standard minifigures). This time the trio consists of Captain America, Red Skull and a Hydra Henchman all of which are very well detailed and printed and are the highlight of this particular set. The most notable pieces (again ignoring the figures for the moment) are those belonging to Captain America's motorcycle which is composed of the standard motorcycle chassis and a dark red standard motorcycle top. The Hydra tank has some nice olive green slopes to give it a slick military look to suit the Red Skull. The two other pieces of note are the top and bottom parts of the 4x4 turntable which is what allows the tanks turret to rotate 360° an ability that is one of the more notable aspects of this set. 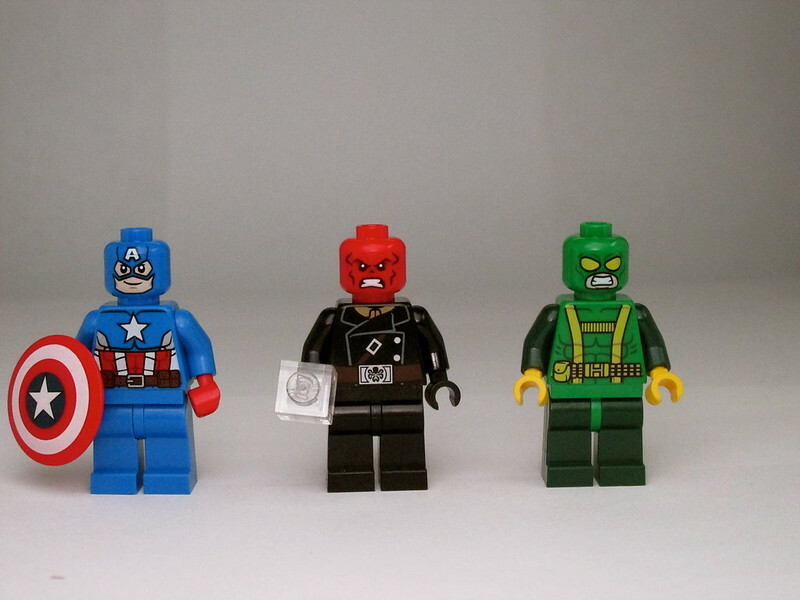 The minifigures consisting of a new Captain America, the Red Skull, and a Hydra agent are as usual for a lincesed theme (particularly the Super Heroes theme) very well detailed and the main draw for purchasing this set. First we get the titular Captain America sporting a brighter blue and red suit (with a few small changes) and a more lighthearted expression than his Avengers movie version. Compared to his movie version Cap' also has more detailed muscle printing, a brown belt with pouches (instead of dark blue) and some grey highlights under his armpits on the front and back which has printing similar to that on the front. Then we have the Red Skull and as I briefly hinted before it's a bit surprising that lego brought such a dark and militaristic villain into minifigure form. Don't get me wrong I'm glad we have the Red Skull as a figure but given that he's a blatant metaphor for the Nazis it's just a bit strange that they would even consider him, but I won't dwell on the subject any further. The Red Skull minifigure is very well done with an enraged grimace on his face, a black military coat, a brown belt with a big Hydra buckle and a bit of light brown undershirt sticking out at his collar. On his back is a continuation of the belt and a few creases for detail. Oddly enough Red skull resembles the Marvel Cinematic Universe version more than the Avengers Assemble version, the latter of which he is based on. The Hydra henchman is a welcome addition to the Marvel Super Heroes theme which so far has been lacking in terms of hired goons. Like the Red Skull the Hydra Henchman has an enraged look on his face, yellow goggles and harness/belt combo with one little pocket and a belt buckle with a big "H" on his belt (presumably for Hydra but perhaps he's a Habs fan) to go with his green uniform, along with some muscle detailing. On the back we have the rest of the belt/harness with three more pockets and for some reason a big yellow "H" on the back of his head (Hydra must really be into branding). Though the vehicles don't have many interesting elements or functions (the only thing notable is the turrets ability to turn 360) by pitting Captain America against his nemesis and a henchman this set gains a good playability factor for its size. There isn't much to the build of Captain America's motorcycle since it's only eight pieces but it's a nice bike with a good colour scheme to go with the Captain. The Hydra tank is pretty well constructed but feels a bit lackluster, though this may be due to my age since I feel like someone younger would thoroughly enjoy the "suspension" function which is really just two wheels balanced in a see-saw type fashion through use of technic pieces. The tank is also strangely flat with the wheels feeling tacked on and the olive sloped pieces make the vehicle look like one of those weird amphibian type vehicles (which is probably intentional though the set description says nothing about it). The turret, with 360 degree rotation ability, makes the tank a bit more interesting. Even with the seemingly inescapable flick-fires bolted onto the sides of the turret and the tank/APC not being that great on a whole (I'd give it a 3 out of 5) I have to say it's nice to finally get a medium-sized ground vehicle for the bad guys since they've been largely limited to medium-small sized aircraft and small ground vehicles. Though the vehicles aren't all that interesting this set like most in the Super Heroes theme maintains a high value for money having great minifigures. The Hydra tank has some nice olive green sloped pieces which, if parted out, could be useful for a military build of some sort. Listed below are the average prices from recorded sales of the last six months as well as the average for current listed items for each minifigure from Bricklink.com. Now due to the set being just under a month old at the time of this review it may still be hard to find and therefore relatively exclusive in some regions, so the prices are likely a bit inflated but they still give a good sense of the ideal selling price. Even when parted out on average the figures sell for a total of CA $23.68, US $20.58, GBP 15.70 almost as much or more than the set in its entirety. Another thing to note is that some people try and build "armies" of henchmen which could mean some even higher potential for the Hydra Agent in the future. Super Heroes is one of the most popular themes currently available and is no doubt aided by the recent and ongoing movies and cartoons. This set in particular is based on the Avengers Assemble which, though I've never watched an episode, is apparently quite popular. Looking beyond that we can guess that this set (even if it didn't have a TV show to help it) will likely be highly sought after once it reaches EOL. The sets sitting higher on the graph, along with being rated best, generally have more exclusive figures, in fact the two highest sets have all exclusive figures just like 76017. Also because the Red Skull and the Hydra Agent are villians outside of movie based sets it is unlikely they will be released in another set anytime soon (perhaps ever) they will very likely boost the price especially once this set reaches EOL in a few years. Though the build is average with a few nice pieces it's the figures and theme popularity that really make this set stand out as a promising investment. With the Red Skull and Hydra agent figures likely to remain exclusive to this set for awhile (possibley permenantly) and both figures having good pontential for growth this set looks well set to become an investment winner once it reaches EOL.